Shortly after Barack Obama and a Congressional Democrats swept to power promising a new era of hope and change, a citizens protest movement emerged threatening to derail their agenda. 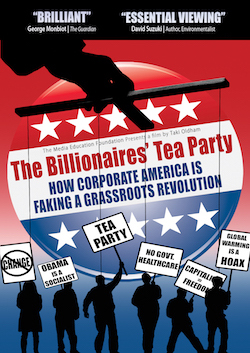 The Tea Party was widely hailed as a exercise in grassroots democracy. But others saw it as a classic example of "astroturfing," a public relations charade designed to mimic a populist revolt. Curious to find out for himself, Australian filmmaker Taki Oldham decided to travel into the heart of the movement. The result is this astonishing look at how moneyed elites have been exploiting legitimate voter outrage to advance their own narrow interests. Oldham takes us inside town hall meetings where angry voters parrot insurance industry PR; finds "citizen groups" working to debunk climate change that are funded by big oil companies; and peels back a movement's down-home image to discover a coordinated network of right-wing shadow groups funded by the likes of billionaire ideologue Charles and David Koch. At once a record of our political moment, and a stunning case study in the power of public relations. "Taki Oldham's documentary is journalism at its best. I wish every American could see it before the election. I just watched it and am even more concerned about the future of our democracy than ever before." "...Vital viewing at a critical time for the United States of Empire. Regardless of your political leanings, Oldham thoughtfully details how modern political propaganda works in our culture, and ought to be required viewing..."
"The Billionaires' Tea Party shows us the dangers of astroturfing, the need to keep our eyes open and to carefully examine what we are being shoveled by self-interest groups, politicians, the media and even our friends and family, stressing the importance for critical thinking, rather than a herd mentality."